On Dead of Summer Season 1 Episode 10, tensions at Camp Stillwater come to a conclusion as Jessie/Holyoke and Amy/Malphus engage in their final battle. On Dead of Summer Season 1 Episode 9, Jessie, Garrett, Alex, and Holyoke attempt to rid Amy of Malphus' possession and stop the demon for good. On Dead of Summer Season 1 Episode 8, an eclispse shakes everyone at Camp Stillwater. Especially Jessie, who gets a visit from a dead Cricket. 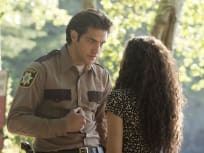 On Dead of Summer Season 1 Episode 7, Deputy Sykes searches to put an end to the ritual Damon and his crew are preparing, hopefully by stopping another death. On Dead of Summer Season 1 Episode 6, Deb flashes back to the events that led her back to Camp Stillwater, and she reminisces her own eventful summer. On Dead of Summer Season 1 Episode 5, counselors take the campers on an overnight camping trip for an unforgettable experience but worry about Camp Stillwater. On Dead of Summer Season 1 Episode 4, Drew flashes back to his life at home, both further into the past and the present, and his relationship with his mother. On Dead of Summer Season 1 Episode 3, Cricket's heartbreaking past is revealed, while things get crazier with the Satanic cult at Camp Stillwater. The campers arrive to Camp Stillwater and one of the kids that Alex and Blotter are in charge of wanders off, leaving one of them out in the cold. On Dead of Summer Season 1 Episode 1, after being closed down for years, a group of Camp Stillwater alums head for a new summer of fun and death.